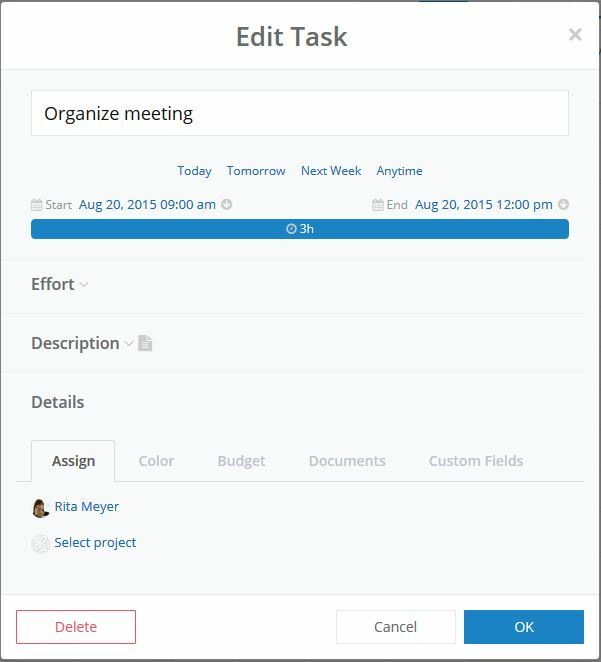 This is the dialog box that opens whenever you edit a task or create a new task by clicking on the New Task button in the Top Bar or by clicking in the calendar to create a new task. You can either only select a start or end date, or select both. The end date of a task is its due date. If you e.g. click on Next Week, the start date is the Monday and the end (due) date is the Friday of next week. If you select Anytime, neither start nor end date is set. If you click on you can select an indiviual date and also set a time. The time line shows you the duration between the start and end date. PLEASE NOTE The duration in the time line is not relevant for the time effort you have to put in to complete the task. It only shows you the time frame during which you can complete the task, with the due date as the latest date until the task is to be completed on. This is where you select who much time it will take you to complete the task. The effort of a task is relevant for the calculation of a person's workload, for budgets and for time tracking entries. Add a short text as a description to the task. IMPORTANT! PLEASE NOTE If you delegate a task to another person, this task is no longer listed in the task list in your Workplace and can no longer be seen or edited by you. If you want to turn the task into a project-related task, click on Select project, chose a project from the list and click OK to close the dialog box. PLEASE NOTE If the task is assinged to you and to a project, it is listed both in the task list in Workplace and in the Kanban board (Tasks) in the project. If you pick a color for your task, a small colored card is shown next to task name in the talk list in your Workplace. If the task is shown in the calendar, the calendar entry is in this color. TIP Use a color coding system for tasks that are not combined in a project. E.g. use red for urgent phone calls or blue for out-of-office appointments. If you switch into Advanced Mode, you can edit further details the tabs Budget, Documents and Custom Fields. Edit a Task | InLoox 10 Web App • Copyright 1999-2019 © InLoox, Inc. All rights reserved.